GEAR S3 BANDS WITH 2 X SCREEN PROTECTOR - This 22mm watch bands FIT FOR Samsung Gear S3 frontier / Gear S3 Classic Smart Watch, bands also fit for any other watches with 22mm frame. With quick release pins on both ends, easy and direct installation and removal. 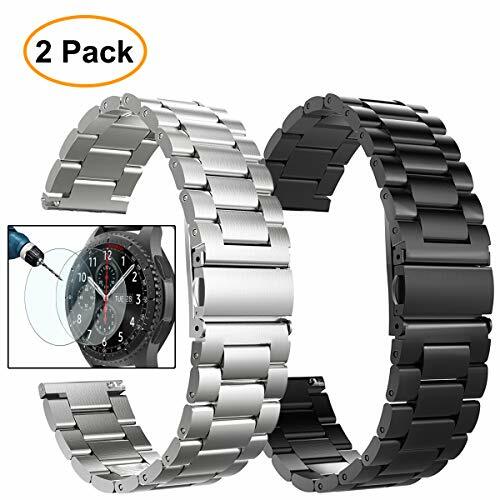 PREMIUM 2-PACK BANDS FOR SAMSUNG GEAR S3 FRONTIER/CLASSIC - Matte metal surface and premium solid stainless steel watch strap fits your Gear S3 Frontier / Classic watch perfectly, brings your Samsung Gear S3 frontier/classic sporty and casual versus dressy/classy. BAND SIZE - The Gear S3 bands Solid Stainless Steel Strap Fits For: 5.7 inch to 8.27 inch (145mm-210mm) Wrist.Using the link removal tool（included in the box ）to remove/add links by yourself to fit your wrist（contact us if you need extra links）. PACKAGE INCLUDED - 2*Gear S3 Band Solid Stainless Steel + 1*Link Removeal tool + 2*Gear S3 Screen Protector + 2*Alcohol Wipes + 6*Quick Release Pins. LIFETIME WARRANTY - This galaxy gear s3 bands is sold exclusively by Cuckoo Trading, only buyfrom Cuckoo Trading could get Lifetime Warranty, Quality Guarantee and excellent customer service.